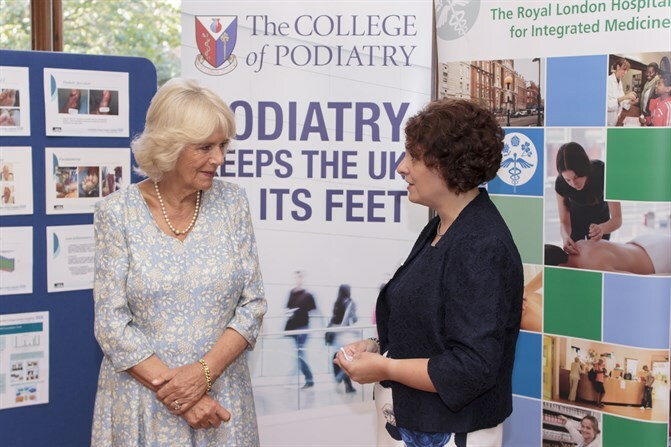 On 8th September, HRH The Duchess of Cornwall attended the Royal London Hospital for Integrated Medicine (RLHIM) in her role as the Patron of the College of Podiatry. She first met with Dr Tariq Khan, who examined a young patient’s feet and showed her the benefits of using therapeutic insoles. She also met with a 6-month old, who was being treated by Dr Khan. After, HRH the Duchess of Cornwall met podiatrists working in many specialist areas including diabetes, dermatology, rheumatology, forensic podiatry, podiatric surgery and podopaediatrics. At the end of the visit, HRH the Duchess of Cornwall was presented with a bouquet of flowers and a gift. She thanked the College of Podiatry for hosting the event. ‘It’s been a fascinating trip, and I will have to come back. As I have said, we couldn’t survive without our feet’. So great to have the HRH the Duchess of Cornwall so involved in such an important side of the Medical Profession.